Just Genesis : What is Holy Tradition? In his essay "Man, Woman and the Priesthood" Bishop Kallistos recognizes that the nature and authority of Holy Tradition must be addressed in consideration of the question of women priests. He correctly notes that "Tradition is not to be equated with cultural stereotypes, with custom or social convention; there is a vital difference between 'traditions' and Holy Tradition." At the very least, we may say that Holy Tradition is the dogma received from the Elders and faithfully passed from generation to generation. As dogma it is not to be changed. The Saints stood for the unchanging Tradition no matter what pressures or persecutions were applied to them. Indeed many were martyred in defense of Holy Tradition. We may also say that Tradition is a worldview in which God is central and humans are accountable to God for all things. (Later we will explore the cultural context from which this worldview emerges.) According to this worldview, God is ever at work fulfilling the divine promises made to the ancestors. If we pursue this we can't help but be struck by the Apostles' proclamation that Jesus Christ is the fulfillment of God's promises to the Patriarchs, to the Prophets and to David. If we consider the teaching of St. Paul, we may go so far as to say that the Tradition of the Elders is the single true and adequate view of Reality; that Reality is synonymous with the Christ through whom all things were made and are held together. Paul’s understanding is that Reality is hidden in Christ and has been revealed in His incarnation, death, resurrection and ascension. Paul's central message is Jesus Christ as the fullness (Pleroma) of all things in heaven and on earth, both invisible and visible. The biblical worldview is a picture of Reality centered in the divine person of Jesus Christ. Scripture and Tradition agree that nothing exists outside of Christ, and what is exists by the virtue of His Life-giving Blood. When we understand Holy Tradition in this light we avoid the erroneous notion that it is something akin to "best business practices". Holy Tradition is a Person. What is the value of keeping the Tradition? Among the Israelites, tradition was a social value, each father being responsible for teaching his children. Every time the Israelites failed to adhere to tradition, they found themselves in trouble. So it is that St. John of Damascus writes, "I beseech the people of God, the holy nation, to hold fast to the tradition of the Church... for the gradual erosion of what has been handed down to us will bring down the whole fabric in ruins." The 'whole fabric' to which John of Damascus refers in his treatise on Holy Images is a specific and historic worldview with identifiable characteristics, including reverence for the ancestors. It is the worldview born of the experience of Afro-Asiaticswho lived long ago. They passed their tradition from generation to generation with great precision because they knew that they were preserving something of great value. Today we may drink of their wisdom in the Bible. The value of keeping the Tradition of the Elders can be traced back to Israel’s African ancestors. An “ancestor” in traditional African religion is someone who died a good death, practiced the traditions of his people and faithfully transmitted them to his descendants. In this patriarchal context, a first-born son is most likely to become an ancestor because he is able to maintain the chain of the generation in a long genealogy. So, Jesus Christ, the only Begotten of the Eternal Father, delivers to us Holy Tradition and He heads a long chain of spiritual descendents. As is still evident among primitive tribal groups, tradition entails the collective wisdom of many generations and the revealed wisdom granted by the Creator. The arrogance of the Enlightenment permeates Western civilization so thoroughly that we are astonished to discover that our empiricism and technological advances have not made us wiser than our primitive ancestors who intimately knew the seasons, accurately read the stars and constellations, and were attuned to Nature's messages from the Creator. If this were not true, St. Paul could hardly have accused the ancients of being without excuse since God has made known in Creation what is most fundamental for humanity to know about the Creator. St. Ephrem the Syrian has expressed this most poetically. He wrote, "If God had not wished to reveal Himself to us there would have been nothing in creation that would be able to say anything at all about Him" (Hymns of Faith 44.7). He expanded on this, proclaiming, "This Jesus has so multiplied His symbols that I have fallen into their many waves" (Hymns on Nisibis 39.17). And finally, he confesses, "Wherever you look, God's symbol is there; wherever you read, there you will find his types. For by Him all creatures were created, and He stamped all His possessions with His symbols when He created the world" (Hymns on Virginity 20.12). 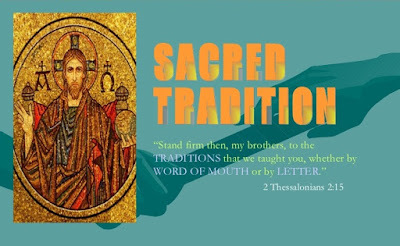 Is Holy Tradition the same as Holy Scripture? It is clear that the preservation of the Tradition of the Elders is not dependent upon the invention of writing. Tradition is not the same as Scripture though Scripture presents the wisdom that humanity needs to avoid deception, destruction and suffering. The assumption that Tradition and Scripture are identical entities is a Protestant perception that fails to express the fullness of Christ and the Church. Certainly the Church receives the Scriptures as authoritative, but what the biblical writers speak of is beyond Scripture and Tradition. Both Scripture and Tradition speak of Reality as being in Christ and very specifically in the life-giving Blood of Christ. For St. Paul, the “pleroma” is the manifestation of the benefits of Jesus’ timeless Blood. The Apostle Paul refers to the Blood of Jesus no less than twelve times in his writings. Because God makes peace with us through the Blood of the Cross, he urges “Take every care to preserve the unity of the Spirit by the peace that binds you together” (Eph. 4:3). Jesus Christ is the Tradition that we receive and His symbols are written in Creation and in the Book from Genesis to Revelation. The Gnostics used “pleroma” to describe the metaphysical unity of all things, but Paul uses the term to speak about how all the fullness of the Godhead dwells in Christ in bodily form (Col. 2:9). This means that the Church can expect no change in Holy Tradition, only the consummation of all things when Christ returns. Paul's understands that the Blood of Jesus constitutes the Pleroma, the single true all-encompassing Reality. Holy Tradition expresses this Reality. The Church is recognized where Tradition is upheld through apostolic preaching, right doctrine and the dominical sacraments, both of which are constitued by the Blood of Jesus with Water and the Spirit (the Three Witnesses of which St. John speaks). The whole fabric of Holy Tradition is one with the Pleromic Blood of Jesus Christ. No where is this more evident than in the institution of the priesthood which is essentially the Messiah Priesthood. The Messianic Priesthood is unlike any other religious institution. It at once makes distinctions in its binary character and brings unity through its power to redeem and cleanse. It makes distinction between God and humanity and it makes distinction between male and female. The distinction in both cases addresses the primeval universal anxiety toward blood, an anxiety which many cultural anthropologists have observed. Underlying the priesthood is the belief that humans must give an accounting to God, especially for the shedding of blood. The priesthood is intrinsically linked to blood. The priest is the functionary who addresses the guilt and dread that accompany the shedding of blood. There are two types of blood anxiety: blood shed by killing and blood related to menstruation and birthing. To archaic peoples both types were regarded as powerful and potentially dangerous, requiring priestly ministry to deal with bloodguilt through animal sacrifice and to deal with blood contamination through purification rites. Not a single female in the Bible served in a priestly role. We can argue a case for women deacons, but the deacon is not intrinsically linked to blood. Despite the efforts of many to create an egalitarian reality, we find no basis in Tradition or Scripture upon which to argue for women priests. The Bible does not say that women can be priests because the binary distinctions that frame the biblical worldview make “woman priest" ontologically impossible. The Scriptures do not forbid women priests because the very idea of women sacrificing animals in the Temple was beyond imagination. It would have been regarded as an affront to the Divine order. It was a bloody business when a priest sacrificed a lamb, so much so that the carcasses were burned outside the walls. It was a bloody business giving birth to children, so much so that the birthing hut was set outside the community. In the ancient Afro-Asiatic worldview from which Holy Tradition emerges, the two bloods were ordained for different purposes and could never share the same space. C.S. Lewis presents the grotesqueness of women priests in his depiction of the savage slaying of Aslan by the White Witch. If you wonder why the image is so troubling, consider that woman was made to bring forth life, not to take it. The egalitarianism that prompts clergy to keep talking about women priests is not consistent with the Biblical worldview. God’s order in creation is binary in structure, distinguishing East from West, Night from Day, and Male from Female, yet holding them together as a single Reality (pleroma) in Jesus Christ. The order exists to orient humans to Reality, to keep us from becoming lost, to prevent us from confusing life and death. In this binary worldview we are given two coordinates. As anyone familiar with orienteering can explain, you must have at least two coordinates to determine your location. And it is senseless to speak of either of the coordinates as superior to the other. Two coordinates enable us to know our earthly space and time. So God has given us the sun and the moon, the planets and the constellations to orient us. God has given us the sunrise in the East and the sun set in the West in orient us. Out of deference to the Creator whose emblem, the Sun, claims the heavens from East to West, Afro-Asiatic chiefs maintained their two wives on a North-South axis. These households marked the northern and southern boundaries of their territories. God also has given us the Three Witnesses: the Water, the Blood, and the Spirit that we might know the Blessed Trinity. In Genesis, two coordinates signals a geographical territory whereas three signals the Kingdom of God. The Church is not a democracy in which leaders may change Tradition according to popular consensus. No councils, even ecumenical councils, can change God’s order in creation. This is God’s message to Job. Who do we think we are to question what God has established? Were we there when God created the world and all that is in it? I've been reading this blog sporadically for a while now, and this post in particular has caught my attention. You've noted the two uses for blood - one, for death/sacrifice, and the other, for creating life. Both involve ritual uncleanliness. If I think of Christ with this in mind, I'm led to a few conclusions. 1) Christ, who in His death has created the potential for eternal life in every one of us, has fused both of these functions together. In that sense, it becomes very clear how Christ is the Savior for all humanity, both male and female, in a way that any normal man or woman could never do. 2) It sharpens the drama of the Cross and its connection to the Eucharist. Whereas blood from sacrifice and blood from childbirth are both unclean, the wine in communion, which most will at least agree has the value of Christ's Blood, somehow is clean. Not only is it clean, but it is also holy, and through it, God can give grace to us. I really don't want to get into wild tangents about Eucharistic theology, but hopefully the point is clear enough: something which used to be unclean and profane has become, in Christ, both clean and holy. Shaughn, I think you are exactly right in your understanding. He is the unique "fusion" of all distinctions, but we can only see this truth when we maintain the distinctions. I tend to watch TV documentaries of third world societies,and consistently there seems to be a clear-cut division of male and female roles and duties. In fact the women often laugh at the thought of a man performing any activity traditionally relegated to a woman. Do you know of any culture which, by tradition, allows women to perform sacrifices for atonement and/ or purification? As touching on atonement, there are none that I know of. As touching on purification, there are rituals whereby female shamans purify homes and places that have been defiled. While priests and shamans serve a similar societal function to relieve the consequences of the shedding of blood, their worldviews were different. The priest is concerned about offense to the Creator while the shaman is concerned about offending the spirits (spiritism or animism). Bloodshed was one of the principal ethical concerns of archaic man. Priests and shamans addressed the guilt and anxiety felt by individuals and communities when human life was taken. Priests offered prayers and animal sacrifice to cover the offense to the Creator of the one who killed. Shamans offered prayers and sacrifices to appease the spirits of the dead so that these spirits would not bring harm to the individual or the community. This visit is my first to your blog, having found it today through Virtueonline, and I feel very fortunate to have discovered it. This article/essay is very informative and very mystical. So, I wonder if this series will answer a question I've had for awhile: How do we know when we are living an ethical life? What are the criteria? Welcome, Jerry, to Just Genesis! Your question is very perceptive. Holy Tradition focuses the question "What is an ethical life?" in a very different way than secular humanism. An ethical life in Holy Tradition is one in which all the God-established boundaries are observed and honored in our lives. We will look at this more closely in the next essay in this series on "Male-Female Distinctions in Holy Tradition", which I will post tomorrow.